Well YEEEHAAA!!! YIPPEEE-KI-YAAA!!! AND WHOOOOAAAA SALLY!!! It's finally Friday again which means a brand new movie debuting at your local picture show!!! 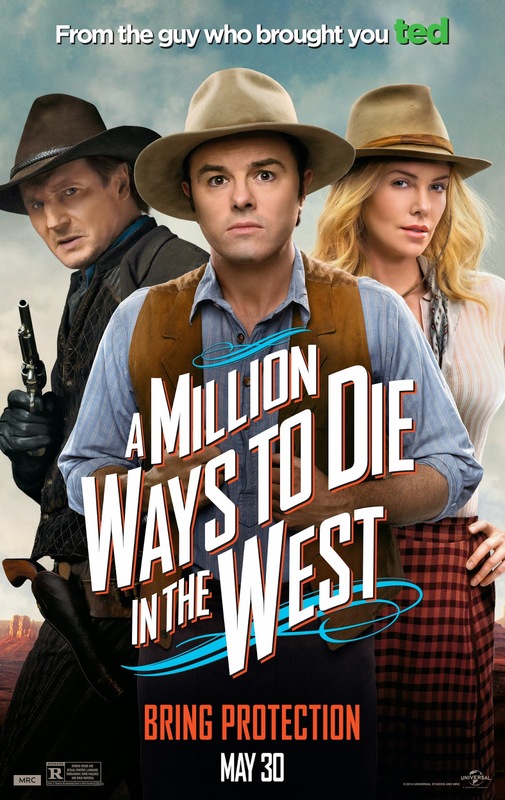 This time it's Seth MacFarlane's One Million Ways to Die in the West! Check out the RED BAND trailer!!! For the first time on the big screen, Seth is in front of the screen as an actual human (as opposed to one of his amazing animated characters)! He's joined by a plethora of talent including Charlize Theron, Amanda Seyfried, Liam Neeson, Giovanni Ribisi, Neil Patrick Harris, Sarah Silverman, Ewan McGregor, and even a much anticipated cameo appearance by our favorite time-traveling mad scientist Christopher Lloyd! The fun starts today at your local theater so ride on down for a heap of hilarity from the great McFarlane (all hail the great McFarlane!!! ).